Hello to all of our ribbon-loving friends! 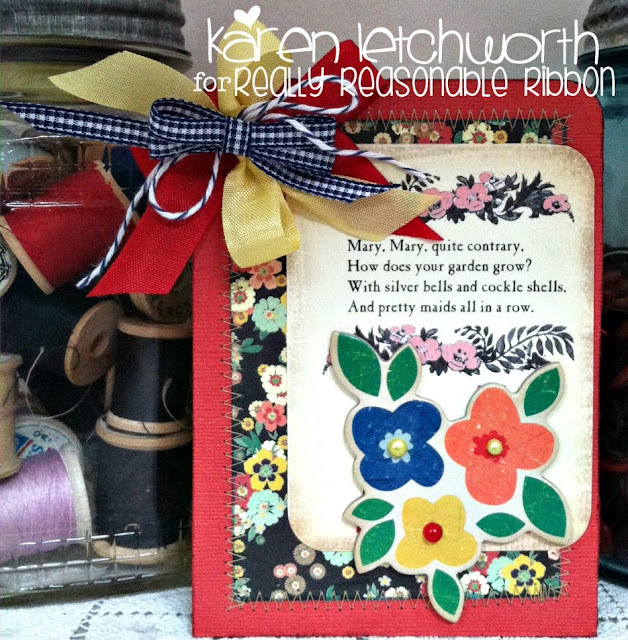 It's Karen Letchworth posting today with a couple of sweet cards I created for a family member. If any of you happen to have a loved one suffering from Alzheimer's, or just losing their memory, I hope you will enjoy this post. We've found that MUSIC is a great way to reconnect with those who are losing their memory. Somehow or another, all those songs are still up there in their minds. By singing old familiar tunes, they quickly open up and start singing along, tapping a foot, smiling, etc. I found a darling set of journaling cards with Nursery Rhymes/songs on them, and have been making them into cards for my Great Aunt. We "sing" the cards to her, and she LOVES it! And Really Reasonable Ribbon helps to make my cards BEAUTIFUL. Once I had my patterned papers, doily, and journaling card in place, I adorned this sweet card with LOTS of great embellishments from Really Reasonable Ribbon. The lovely bow was made from Mimosa Yellow Seam Binding, Dusty Olive Seam Binding, and Solid Red Baker's Twine. I also tucked in several of the GORGEOUS Wild Orchid Crafts Mulberry Flowers carried at Really Reasonable Ribbon. 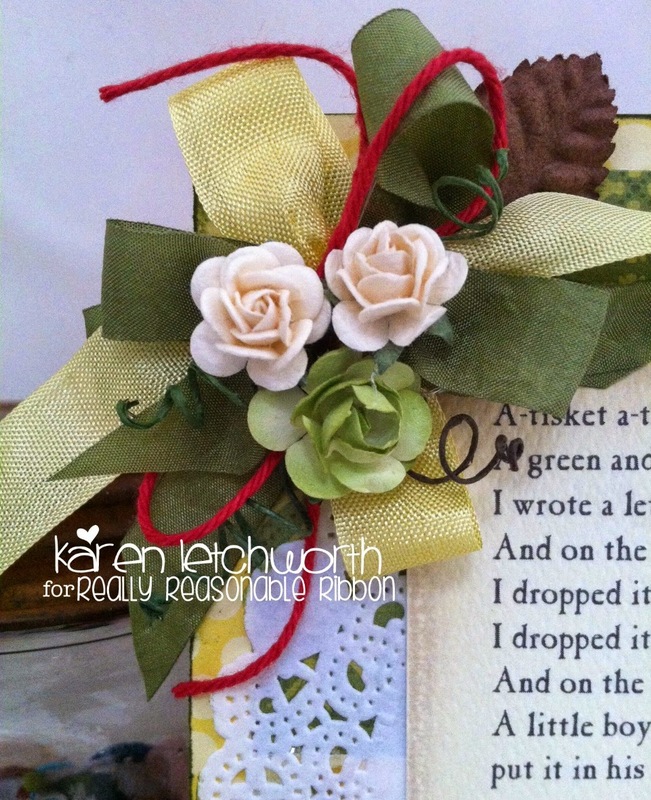 The flowers I used include the Deep Ivory Open Roses, a Green Rose, and a gorgeous Brown Leaf. The sweet stems on the Mulberry Flowers and Leaves are so cute. I use a pencil or crafting tool to "swirl" them, and they add such a soft, sweet touch to your cards. 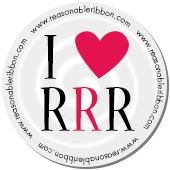 Really Reasonable Ribbon has SO many lovely ribbons, trims, flowers, and floral accents that will help to make your cards and projects look amazing. Why not treat yourself today? You deserve it! My second card uses the Blueberry Baker's Twine, Mimosa Yellow Seam Binding, Lipstick Red Seam Binding, and Royal Blue Micro Gingham Ribbon to create my bow. 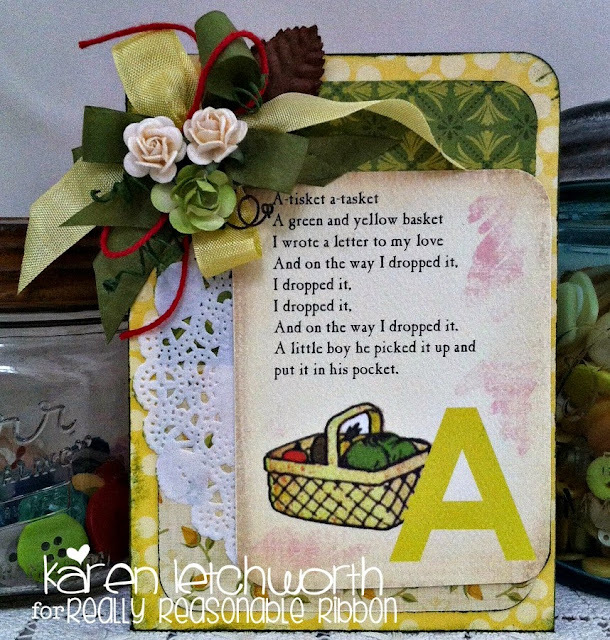 It's easy to see how Really Reasonable Ribbon's sweet trims help you create a bow that takes a simple card and quickly makes it something extra special. Thanks for stopping by, and I welcome you to visit my blog, My Cup Runneth Over, for a closer look. There are more details on my blog about the journaling cards if you're interested in making these cards for a loved one. I would also LOVE to have you play along in our current challenge. Have a great week! Lovely card and love the details !